Today’s business world is dynamic and competitive therefore organizations looking for Talent, extrovert graduates who belong to high degree of adaptability quality. Today’s business graduates will be the core part of business organization. Therefore, business graduates need to have both theoretical & practical knowledge to manage the business activity properly. In order to be familiar with organizational culture and to gain some practical knowledge about an organization our Department provides a ninety days internship program as a part of the MBA program. After completion of the program period a student must submit the report on the assigned topic to the Supervisor and the department. This program carries six credit hours out of 54 credit hours of the MBA program. I was assigned in the Dutch-Bangla Bank Limited through my Internship supervisor. I have selected DBBL to perform my internship program because Dutch-Bangla Bank is the first bank in Bangladesh to be fully automated and introduce Electronic Banking. The automation was completed in 2003, but further additions and features are continuously being added and upgraded. DBBL has adopted the same exact automation solution used my many international banking giants. Although this was significantly more expensive than other solutions, it is a small price to pay for a client’s peace of mind. A DBBL client now has unrivalled access to banking from any DBBL branch, ATM and POS. All of these services are free-of-charge and are surprisingly affordable for everyone. Even though DBBL has invested more in Electronic Banking more than any other bank, the division was never intended to be profitable. It was undertaken with the same mindset DBBL undertakes its Corporate Social Responsibility tasks. This is why you pay barely nothing even though these same services would cost you much more in other countries and other banks. Never has any bank given so much for free. DBBL also has the largest ATM network in Bangladesh. This gives DBBL clients full access to ‘anytime anywhere’ banking nationwide. All international and many local banks use the DBBL ATM network for their own clients. DBBL has installed over 1000 ATMs nationwide. As with most things, ATM access to all DBBL ATMs is unlimited and free for all DBBL clients. If a client of a member bank (not DBBL) uses a DBBL ATM, the member bank may add a transaction charge. DBBL has the largest IT budget in Bangladesh. DBBL maintains the state-of-the-art Electronic-Banking Division. The Electronic-Banking Division oversees and maintains DBBL’s investment as well as implementing upcoming projects. DBBL is the only local bank to have a off-site Data Recovery Site (DRS). DRS ensure that customer records are safe, backed-up, and up to date in the event of a major catastrophe at the Electronic-Banking Division headquarters. Since 2004, DBBL has introduced mobile and SMS banking. With a mobile phone, customers can perform many banking operations with their phone. DBBL is a primary license holder for both VISA and MasterCard. It is authorized to issue and accept payments from both organizations. DBBL also works closely with both organizations to bring you the latest in card technology. DBBL also offer Visa and MasterCard Debit Cards. I think DBBL plays an important role for the economic growth of the country by providing its banking services through over the counter and the on-line services. It seems to me that in DBBL, there is a sufficient opportunity to gain the practical knowledge about the Electronic Banking Activities. Here I worked in several Departments that helped me a lot to gain some practical knowledge. After completion of my 90 days Internship period in consulting with the supervisor of the program, I have selected a topic named “Electronic Banking in DBBL”. On the basis of this topic, I have prepared my Internship Report. Dutch-Bangla Bank is the first bank in Bangladesh to be fully automated and introduce Electronic Banking. The automation was completed in 2003, but further additions and features are continuously being added and upgraded. DBBL has adopted the same exact automation solution used my many international banking giants. Although this was significantly more expensive than other solutions, it is a small price to pay for a client’s peace of mind. A DBBL client now has unrivaled access to banking from any DBBL branch, ATM and POS. All of these services are free-of-charge and are surprisingly affordable for everyone. Even though DBBL has invested more in Electronic Banking more than any other bank, the division was never intended to be profitable. It was undertaken with the same mindset DBBL undertakes its Corporate Social Responsibility tasks. This is why you pay barely nothing even though these same services would cost you much more in other countries and other banks. Never has any bank given so much for free. 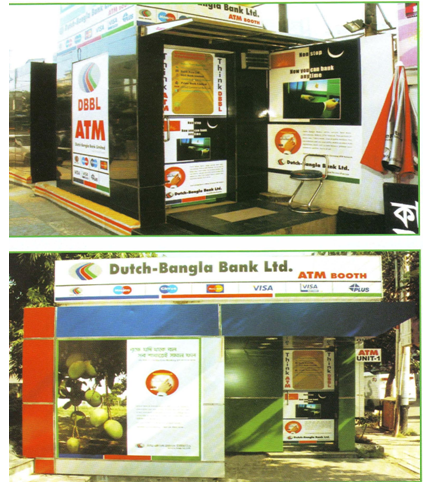 DBBL also has the largest ATM network in Bangladesh. This gives DBBL clients full access to ‘anytime anywhere’ banking nationwide. All international and many local banks use the DBBL ATM network for their own clients. DBBL has installed over 800 ATMs nationwide. As with most things, ATM access to all DBBL ATMs is unlimited and free for all DBBL clients. If a client of a member bank (not DBBL) uses a DBBL ATM, the member bank may add a transaction charge. DBBL has the largest IT budget in Bangladesh. DBBL maintains the state-of-the-art Electronic-Banking Division. The Electronic-Banking Division oversees and maintains DBBL’s investment as well as implementing upcoming projects. DBBL is the only local bank to have a off-site Data Recovery Site (DRS). DRS ensure that customer records are safe, backed-up, and up to date in the event of a major catastrophe at the Electronic-Banking Division headquarters. Dutch-Bangla Bank Limited (DBBL) is a technology driven institution and a fully online banking organization. It caters to progressive clients who are accustomed to high levels of technology use and innovation. DBBL strives to provide its customers the latest in banking technology and delivery channels to make banking the most seamless task for its customers. DBBL’s technology vision is centered around the view that a high-end technology service is the innate right of the customer. A customer has the right to do seamless banking from any location they please and it is completely within their rights to expect this service uniformly through any medium. This vision leads to DBBL undertaking a comprehensive Information Technology (IT) project in 2003 where the entire system was automated at a cost of Tk. 1 billion. Keeping the security and reliability in mind, the management of the bank identified some hardware and software components for the project. Among hardware installations were the multi-processor clustered servers, ATM, POS Terminal, Card Personalization System, High Capacity UPS, Host Security Module, Networking Equipment, and among the software installation were the Core Banking Software, Internet Banking Software, SMS & alert banking software, switching software, database and operating systems. For case studies and acquiring technical knowledge about these hardware and software, a management team visited in different banks in Srilanka and India in January 2003. Thereafter the bank selected state – of – the – art technologies optimizing the cost for the project. Besides this, the bank has setup the largest and modern data center and online-synchronized Disasters Recovery Site (DRS) in Bangladesh to safe – guard the customers’ interest. A set of servers, networking equipments and UPS identical to the data center is installed at DRS. In case the data center is destroyed for any reason, the DRS will take over the control of branches, ATMs, POS Terminal, Internet Banking, SMS & alert banking systems. DRS is a crucial system for any bank and is standard for all leading worldwide banks, as the success of a bank after any disasters depends highly on its DRS. The implementation of the automation project started with formation of a core team. A team of 22 members, which included 14 members from the business and 8 members from the IT, took an eight weeks long extensive training on the project implementation issues. After completion of all necessary formalities, such as floating of international tender’s, evaluation of tender documents the board of Directors of DBBL formally approved the project at a cost of Taka 250.00 million in September, 2003. The main components of the project were the world renowned, robust and tested banking software FLEXCUBE from ‘I-flex solution limited India world famous server from IBM USA switching software form oasis technology, Canada, world renowned Die bold ATM machines and Hyperion POS Terminals. The project also included an online disaster recovery site (DRS), first of its kind in Bangladesh to have effective disaster management system in place. In February 2004, the User Acceptance Test (UAT) started in the data centered of the bank. The core team and networking team started installation of the servers, networking equipments and software, and customization of the same to adopt the prevailing banking rules and regulations of the country. Side by side, the switching team started installation of ATMs and POS Terminals and testing of their performance with the switching software. After UAT was over, the roll – out of the branches from the old system to the newly installed system began. The IT division rolled – out one branch at every weekend and installed ATM under the respective branches. On 18 December 2004 the roll – out of all the branches of the bank was completed. The year – end operation of the bank has completed successfully on 30 December 2004, centrally at the data centre. The entire automation and DRS are installed and maintain by the DBBL alone. The bank takes great pride that the entire system was the result of in – house innovation and dedication and with par to international standards. 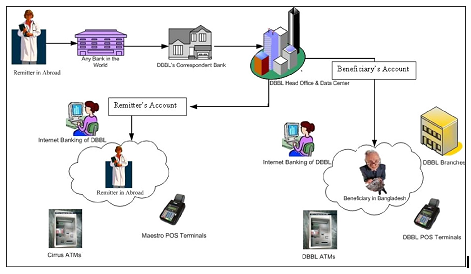 communication channel of DBBL online banking system. All the components are connecting with fiber optical network. And the head office of DBBL’s IT department can control any of the branch computers by this network. And they can provide any types of solution by sitting the head office. Thereafter, the bank opened 32 new branches at different cities/towns with ATM facility. From the first day, these branches and ATMs are on-line and provided real – time banking services. From the beginning, the valued customers of these branches are getting truly on-line facility, 24 hours a day, 7 days a week, through all the branches, ATMs and POS terminals all over the country and through the Internet from all over the world. Using the new ATM services, the customers of DBBL can perform a range of banking activities including cash withdrawal, balance inquiry, printing mini statement, utility bill payment and fund transfer, 24 hours a day, 7 days a week and even on holidays. Using the POS terminals the customers can pay shopping / dinning / hotel bills at various merchant locations throughout the country using DBBL cards and any Master Card or Visa branded cards. Using the Internet Banking System the customers can access his/her account anytime from anywhere from the world through internet and can enjoy a plethora of banking services including account summary, account statement, fund transfer, bills payment, initiation and execution of Standing Instructions, opening and redemption of Term Deposits from/to his savings or current account and much more. For secured and fast delivery of foreign remittance to the beneficiaries all over the country, DBBL’s on-line banking service and ATM network provides a unique solution. Now the non-resident Bangladeshis can send their money to their near and dear ones on the same days. After receiving the advice from different exchange houses abroad in electronic form, the Bank now credits the beneficiaries account directly from head office. Immediately the beneficiary can withdraw money from any branch counter or ATM booth of DBBL. The introduction of on-line banking services along with various channels attracted a good number of retail customers mostly the service holders-, which is the base for the bank to start its retail (personal) credits business. Their loyalty to DBBL allows DBBL to focus more on this type of retail oriented client base. In 2005, the Bank started issuing of MasterCard’s debit products – Maestro and Cirrus cards, and accepting MasterCard’s entire product range including MasterCard credit card, Maestro and Cirrus cards. In 2006, the Bank started issuing of Visa’s debit products – Visa Electron & Plus. From then onward, our valued customers have the option choose from the widest selection of cards. After obtaining the acquiring licenses from MasterCard and Visa, and its execution in 2005, all MasterCard and VISA cardholders of other local and foreign banks are able to withdraw cash from our ATMs and pay shopping /hotel / dining bills using our POS terminals at the standard prescribed charge of the MasterCard and Visa. In 2006, the Bank launched SMS and alert banking system for the first time in Bangladesh. The SMS and the alert banking system is a modern tool for banking using a mobile phone. This service puts the banking at the hands of our customers. The customers can now avail a wide range of banking services through his mobile phone, 24 hours a day, 365 days a year sitting at his home or vehicle. DBBL clients are getting ATM access free of charge. For ATM access to other banking institutions, the cost per transaction at ATM is around Tk. 70/- (which is USD 1.00 and USD 1.25 per transaction if routed through Visa and MasterCard network respectively),. This price would be even higher when accounting in bank surcharges. To help the customers of other banks, DBBL made separate agreements in which DBBL has agreed to charge only Tk 10/- per transaction to the partner banks. This price is insignificant considering the charges that other banks still pay to local ATM companies and the standardized Visa/MasterCard charges. It should be noted that even with this pricing and the continuing costs of maintaining the largest ATM network in the country, the Tk.1 billion investment of DBBL is not very rewarding. DBBL never scrutinized the project’s profitability but instead focused on the intrinsic benefits that it will bring to the customer. DBBL wants the customers of other banks to avail the same benefits of DBBL customers. This will help develop the socio – economic condition of the country as a whole. More and more people will be able to get benefit of the modern technology both in urban and rural areas at an affordable cost. DBBL is bearing the differential cost as part of its CSR (Corporate Social Responsibility) activities. Even after servicing the numerous clients, DBBL decided to help member banks in their automation services. DBBL extended its support and expertise for reaching a common end goal of both DBBL and the partnering bank – serving the customer. To extend the ATM facilities to the suburban and rural areas where there is no DBBL – branches, DBBL has taken an initiative to install ATMs at the premises and nearby sites of other bank branches. Mutual Trust Bank has signed an agreement to this effect. Many other banks are in the pipeline to accept this service offered at a very attractive terms and conditions. DBBL has introduced new economical services for banks, which do not have the facility to produce cards and host the card information (which involves expensive switching software and hardware for transaction pre-authorization). Now DBBL can offer these banks with card personalization, PIN generation and hosting, PIN Mailer printing, and transaction pre-authorization. This is essentially the entire card automation/ services for a fraction of the price it would take the institutions to implement it themselves. First Security Bank Limited is the first bank that signed with DBBL to avail these services. This is the real example of DBBL ATM booth. Now many of the banks collaborated with DBBL for using their ATM network. Nexus PRO-Cards (processor debit & Credit). Nexus PRO is a revolutionary card first and only offered by DBBL in Bangladesh. It is the most advanced card in the world. Unlike normal cards, Nexus PRO features a processor chip that makes the card the most secure and faster than any card worldwide. DBBL has worked with both Visa and MasterCard to bring this revolutionary card to the market. It took 3 years for DBBL to implement what Visa and MasterCard both deem as the future card standard. It encompasses the digital age and the new technologies that have emerged in the electronic age. Visa and MasterCard both realized that the normal card is 40 years old and the amount of fraudulent transactions were loosing customers billions. North America will be have Nexus PRO card compliant by 2016.But now DBBL already the only fully Nexus PRO compliant and certified. DBBL’s entire infrastructure (including ATMs) have had a costly upgrade to enable Nexus PRO to Bangladesh. Normal cards use a magnetic strip at the back of the card. The information and security on that magnetic strip is stationary and does not change. Hence it can be easily duplicated. But NexusPRO’s processor uses its processor to fully digitally lock all the information. It prevents the information from being copied as the processor ‘generates’ security codes rather than store it. It is a form of encryption. But NexusPRO goes even further. Visualize a series of locks and keys. Every lock has a corresponding key. Your account at DBBL has a digital lock, while your NexusPRO card is a digital key to access it. When a fraudlent card tries to access your account, DBBL knows that the correct digital key is not presented and denies access. Further more, DBBL replaces the account lock every second. But because a genuine NexusPRO card can generate the correct key using the processor, it can access open the account lock at that very moment. The next instance DBBL changes the account lock again, and your NexusPRO card has to generate the key again using its unique processor. The NexusPRO system also prevents one NexusPRO card from accessing another NexusPRO card. This is because all processors are unique. All NexusPRO cards generate keys differently and DBBL is aware of all the differences and knows which card is which so they can access only their authorized accounts. However this was just a brief overview how your NexusPRO card works. The detailed workings are more secure and even more revolutionary. Dutch-Bangla Bank Limited (DBBL) commenced its Debit card operation in August 2004. Initially DBBL has issued only DBBL NEXUS classic cards to the accountholders. At present there are over 150,000 + cards in the hands of the customers. At the moment, the total card market size (approx.) in Bangladesh is 8 lac(approximate). Among these, DBBL is having around 20% market share with 150,000+ DBBL NEXUS cards. DBBL debit cards come with the client’s photo printed on it and requires a secret PIN verfication by the client. A credit card only requires a signature (which can be forged) and no PIN verfication for a transaction. That is why, for day-to-day banking, DBBL recommends debit cards. Each card comes with a PIN number which must be protected at all times by the client. The PIN number is used as a password for withdrawing cash at DBBL ATMs and accessing DBBL banking services. In addition to normal debit card features, DBBL Nexus Gold and DBBL Nexus Silver debit cards come with automatic overdraft facilities (credit). This allows the cards to have a credit amount. Clients can access the credit amount instead of choosing to access the money in their account. This allows the debit card to perform in the same manner as a credit card. A small loan is issued when clients exercise this feature. DBBL offers the most secure credit card in the market. A credit card offers greater flexibility for international travel in locations which do not accommodate DBBL Debit Cards. But a credit card is inherently less secure unless it is a Nexus EMV credit card. The reason why DBBL entered the credit card market at such a late stage is because it did not want to compromise your security until DBBL itself implemented Nexus EMV technologies. All credit card DBBL issues are Nexus EMV credit cards. Normal cards use a magnetic strip at the back of the card. The information and security on that magnetic strip is stationary and does not change. Hence it can be easily duplicated. But Nexus EMV’s processor uses its processor to fully digitally lock all the information. It prevents the information from being copied as the processor ‘generates’ security codes rather than store it. It is a form of encryption. But Nexus EMV goes even further. Visualize a series of locks and keys. Every lock has a corresponding key. Your account at DBBL has a digital lock, while your Nexus EMV card is a digital key to access it. When a fraudulent card tries to access your account, DBBL knows that the correct digital key is not presented and denies access. Further more, DBBL replaces the account lock every second. But because a genuine Nexus EMV card can generate the correct key using the processor, it can access open the account lock at that very moment. The next instance DBBL changes the account lock again, and your Nexus EMV card has to generate the key again using its unique processor. The Nexus EMV system also prevents one Nexus EMV card from accessing another Nexus EMV card. This is because all processors are unique. All Nexus EMV cards generate keys differently and DBBL is aware of all the differences and knows which card is which so they can access only their authorized accounts. 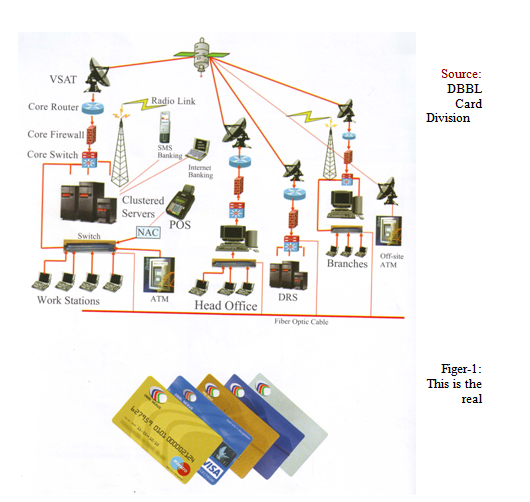 However this was just a brief overview how your Nexus EMV card works. The detailed workings are more secure and even more revolutionary. With a vision of rendering services through new financial products, Dutch-Bangla Bank Limited has started issuance of DBBL-NEXUS Gold and Silver Credit Card facility since June 2006. With this card, the cardholders can avail a OD facility from Tk.10, 000/- (ten thousand) up to Tk.2, 000,000/-(twenty lac) depending on credit worthiness. (e). DBBL borrowers, SB or CD account holders. Service Holders & many more. DBBL allows you to do seamless internet banking. This allows you to review your account, statements, paying bills as well as making some transactions. Because of local banking regulations, DBBL is not allowed to provide some types of transactions even though it is fully capable. The customer can choose an account and enter the Cheque number for which the status should be viewed. Payment of mobile/T&T phone, Gas, Electricity, Water, Internet, Credit Card bills from customer’s Savings/Current account. Payment of mobile/T&T phone, Gas, Electricity, Water, Internet bills from customer’s account. Foreign Currency Exchange rates and interest rates enquiry. • DBBL handles your remittance entirely FREE OF COST. • Your money will reach to Bangladesh within few hours. • You can enjoy Internet Banking facility. You can even check through Internet that your money already reaches to your account or to the beneficiary as per your instruction. • You can pay utility bills, fixed installments from your account through Internet. No need to come to the Bank. • You or the beneficiary of your remittance can take the money from any Branches of DBBL, no matter where the account is domiciled. • You or the beneficiary of your remittance can use ATM or POS terminal to withdraw or use cash. Whom do you want to send money? What to do? • If you want to send money to your own account, then you need to open an account in your name with any Branch of DBBL of your choice. • If you want to send money to any person of your choice, he/she needs to have an account with any Branch of DBBL. • Even you can send money through DBBL to any person having an account with any Bank in Bangladesh. However, we suggest you to open account with DBBL or ask your beneficiary of remittance to open account with DBBL to enjoy the tremendous facilities of ON-LINE Banking of DBBL. What to do to remit money to Bangladesh? 1. Step in to your bank. 2. Go to the “Customer Transfer” desk. 3. Tell the bank-officer that you want to send money to Bangladesh through DBBL (SWIFT BIC: DBBL BD DH). 4. Give the following SSI of DBBL to bank-officer who needs this to remit the money promptly. To avail this service your beneficiary needs to open an account with any branch of DBBL. You can now send money directly to the beneficiary’s account from any bank in the world. Please follow the procedure mentioned in “What to do to remit money to Bangladesh”. Your beneficiary’s account will be credited within few hours from the International Division of Head Office of the Bank. This is possible due to the centralized on-line system of the bank. Now your beneficiary can go to any branch or ATM of DBBL and withdraw cash; go to any POS terminal of DBBL and purchase goods & services using DBBL-NEXUS card; or use Internet Banking service of DBBL to do banking or pay various bills. DBBL is also going to introduce Credit Card – both Local and International with a global brand. DBBL branches are also available in this web site. Now as usual, you can remit money to your own account any time from any bank in the world. Please follow the procedure mentioned in “What to do to remit money to Bangladesh”. Once you send money to your account with DBBL, your money will grow with us. You can use Internet Banking facility of DBBL to manage your cash efficiently. You can open FDR from your account, pay bills / loan installments, or provide standing instruction to transfer a fixed amount of money in a particular day of a specified period (say month, quarter, year etc.) to your beneficiary’s account. You can also monitor your all accounts regularly including checking of your account statements. All these can be performed by you sitting abroad at any time through internet. Using Maestro-Cirrus debit card of DBBL, you can withdraw money from any of the 300,000 cirrus ATMs in around 100 countries. You can also make payments for purchases in more than 800,000 Maestro outlets (POS terminals) worldwide. On the other hand, your beneficiary will get money as per your instruction given through internet. You can modify or cancel the instruction any time if you want to do so. All the instructions will be carried out by the system automatically. Now your beneficiary can go to any branch or ATM of DBBL and withdraw cash; go to any POS terminal of DBBL and purchase goods or services using DBBL-NEXUS card; or use Internet Banking service of DBBL to do banking or pay various bills. At the beginning of the year 2005, our Bank has been exerting much emphasis on INWARD REMITTANCE. By this time the Bank established extensive drawing arrangement network with Banks and Exchange Companies located in the important countries of the world namely in the United Arab Emirates, State of Kuwait, State of Qatar, State of Bahrain, Italy, Canada and United States of America. In the meantime, Dutch-Bangla Bank Limited gained the faith of the Bangladeshi Wage Earners in sending their hard-earned money to their respective beneficiaries in Bangladesh in shortest possible time. Expatriates Bangladeshi Wage Earners residing in those countries can now easily remit their hard-earned money to Bangladesh with confidence, safety and speed. Western Union Financial Services Inc. U.S.A. is a reliable money transfer company. Dutch-Bangla Bank Limited has set up a Representation Agreement with Western Union Financial Services Inc. U.S.A. as on 14th February 2006. Millions of people have confidence on Western Union for sending money to their friends and family. Through Western Union Money Transfer Service, Bangladeshi Wage Earners can send and receive money quickly from over 225,000 Western Union Agent Locations in over 197 countries and territories world wide, only by visiting any branches of Dutch-Bangla Bank Limited in Bangladesh. 02 U.A.E U.A.E. Exchange Centre LLC. 03 Kuwait Kuwait Asian Int’l Exchange Co. W.L.L. 04 Kuwait Dollarco Exchange Co. Ltd.
05 Canada East Bengal Exchange Co.
06 USA Prabhu Money Transfer. 07 USA Western Union Financial Services Inc.
DBBL is the unique name of true Electronic Banking. All branches of DBBL is in one network. One can get all types of facilities from any branch of Bangladesh wherever the branch he has maintaining his account. When any client of DBBL provides any cheque to another person who has also an account in DBBL then he can get this money instantly without any procedure of clearing house. When the person submit the cheque of another person to transfer the fund to his own account then he needs to write a deposit sleep where he will be write his name, account number, cheque number, cheque date, the cheque amount, and also his signature. After getting the cheque along with the deposit sleep the banks at first will cheek the payees balance from where the fund will be transferred. Then the signature on the cheque with the specimen signature he provided to the bank. If these are ready then the authorized officer will make a phone call to the cheque holder for the conformation of this cheque. Sometimes he would be asked different types of tactical questions like his date of birth provides by the banks database and any other questions for identifying the real person. After conformation the officer will write down the details of the conformation that he got from the phone call. Then he will input the details of the cheque and the receivers account number into the software. When the amount exceed 20,000 (thousand) then its need the authorization of manager or 2nd manager. After verifying all the things the top level officers will grand this authorization request. At last the officer will submit the fund transfer request that is granted by his superior. And instantly the fund will be transferred to the parties’ accounts. The normal bankcard was introduced 40 years ago and has failed to keep up with the rapid technology and security development that has been taking place in the industry. Its inherent problems caused competitors Visa and MasterCard to collaborate and create a next generation bankcard that will keep up with rapid security developments called EMV. North America has started the transformation process in 2005 and has set the finishing deadline to 2016, where the entire continent will have upgraded to next-generation EMV technology. DBBL keeps track of the latest security developments internationally and strives to give the same level of service to its local clients. To give more peace of mind to its customers along with more security, the Bank has also decided to implement EMV (Euro Pay, MasterCard and Visa) cards (both debit and credit) and acquiring of EMV compliant ATMs and POS terminals. DBBL for the first time in this region is going to offer a complete EMV (both in issuing and acquiring for both the Visa and MasterCard) solution for its customer with an investment of another Taka 60 million (in addition to its IT investment of Taka 1 billion). DBBL is currently scheduled to be the first and only bank in SAARC to offer the full EMV solution (and only second in South East Asia). The entire transformation is scheduled to be completed by mid 2010. The solution requires that the entire system (including POS, ATMs and cards) be upgraded. While the Nexus EMV card may look similar to a normal card, the technology on it and supporting it is revolutionary. It uses an onboard computer chip instead of a magnetic strip and relies on DBBL’s data center for on the spot verification. It features built in encryption algorithms mandated by Visa and MasterCard, which are impossible to duplicate or modify. It was designed and researched by Visa and Nexus EMV is the future card standard. DBBL also taking the strong initiatives to get the update version of FLEXCUBE software to provide their customers faster services. This procedure will be completed within 2010. (http://www.dutchbanglabank.com/webnew/atm_locations.aspx) in this address you know all DBBL ATM Branch and your ATM location. (http://www.dutchbanglabank.com/webnew/merchant_locations.aspx) in this address you know merchant location in Bangladesh. These Terms and Conditions provide information about the DBBK Internet Banking service provided to User by Dutch-Bangla Bank Limited. and set out the rights and obligations of the User and DBBL, in connection with the User(s) use to the DBBL Internet Banking Service. In the event of any conflict between these Terms & Conditions and the Rules and Regulations governing the User(s) account with DBBL, these Terms and Conditions shall prevail. For the purpose of this document, “Internet Banking” refers to the internet banking services provided by Dutch-Bangla Bank Limited provided services such as balance enquiry, details about transactions in the account(s), statement of account, utility bill payment services etc. “User”, “he/she” and/or “his/her” means DBBL customer(s) using DBBL Internet Banking and “DBBL” means Dutch-Bangla Bank Limited, a company duly incorporated under the Companies Act 1994, having its Registered Office at Sena Kalayan Bhaban (3rd, 4th, 5th and 10th Floor) 195 Motijheel C/A, Dhaka-1000; and its branch or its assigns in respect of which the service will be available. These Terms & Conditions form the contact between the User and DBBL for using Internet Banking. The User shall apply in the prescribed form for use of Internet Banking. DBBL at its sole discretion to accept or reject any such applications. By applying for Internet Banking for the first time, the User acknowledges and accepts these Terms & Conditions. Notwithstanding anything contained herein, all Terms & Conditions pertaining to the accounts shall continue to apply. DBBL will provide the customer with unique customer identification (“Customer ID”) and a temporary (“Password”) in the first instance. As a safety measure, the User, as a customer should immediately change Password upon his/her first login. User is requested to change his/her Password frequently thereafter as far as possible. User’s authorized signature. This signature authorizes and validates directions given just as an actual written signature does. User is responsible for maintaining the confidentially of Customer’s Login ID and Password. User should agree that he/she will not under any circumstances disclose his/her Password to anyone, including anyone claiming to represent the Bank or to someone giving assistance on a technical helpdesk in connection with the service. It should be clearly understood that Bank employees do not need User’s password for any reason whatsoever. If User gives his/her Password to anyone or fails to safeguard its secrecy, he/she does so at his/her own risk because anyone with User Password will have access to his/her accounts. If User forgets the Internet Banking password, he/she has to request for issue of a new password by sending a written request to DBBL. If Customer’s password is lost or stolen, or is known by another individual, he/she must notify DBBL immediately. The User agrees and acknowledges that DBBL shall in no way be held responsible or liable if the User incurs any loss as a result of information being disclosed by DBBL regarding his Account(s) or carrying the instruction of the User pursuant to the access of the Internet Banking and the User shall fully indemnify and hold harmless DBBL in respect of the same. User is solely responsible for the maintenance, installations and operation of User’s computer and for the software used in accessing Internet Banking. DBBL shall not be responsibility if the Internet Banking System does not working properly due to the failure of electronic or mechanical equipment or communication lines, telephone or other interconnect problems, normal maintenance, unauthorized access, theft, operator errors, severe weather, earthquakes, floods and strikes, or other labor problems. DBBL reserves the right to change and recover from the User(s) service charges, as may be fixed time to time. The User hereby authorizes DBBL to recover such charges from his/her account(s). Please refer to DBBL’s charges schedule for specific charges information. Charges are subjected to change from time to time at DBBL’s discretion. Upon obtaining Customer ID and Password, User is requested to check the list of his/her accounts with DBBL. If any of User account is missing, please inform this to DBBL immediately. If a third party account is linked to User’s ID, please inform this to DBBL also. Do not access it or do not perform any transaction on that account. Such activity, if done, will be treated as fraudulent activity. If User believes unauthorized transactions are being made with his/her account, he/she should change the Password immediately and notify the DBBL. The User should check the Statements for all of his/her accounts for any unauthorized transaction. In case of any discrepancy in details of any transactions carried out in respect of the account, in that event User should immediately inform DBBL in writing. Standing Instruction initiated through Internet Banking. No third party transaction is allowed except utility bill payment through DBBL Internet Banking. Service and shall cover all the utility bill payments of different utility service provider(s) (Billers) as mutually agreed between DBBL and the utility service provider(s). The User should accept that he/she will be responsible for putting in the correct account number and transaction amount for the fund transfer request. In such case, DBBL will not be liable for any erroneous transactions incurred arising out of or relating to the customer entering wrong account number and amount. Upon DBBL decision, there will be a transaction amount limit though internet banking. Maximum amount of transaction limit can be subjected to change from time to time at DBBL’s discretion. Any transaction made after working hours or on public/bank holidays, the transaction value date will be the next working day. No transaction is allowed from a non-convertible taka account to a convertible account. Any conversion rate of any foreign currency shown and interest rate are only for customer’s convenience. It cannot be taken as price quote from bank’s end. The User shall ensure that there are sufficient funds (or prearranged credit facilities) in my account for transactions through the Internet Banking. DBBL shall not be liable for any consequences arising out of its failure to carry out the instructions due to inadequacy of funds and/or credit facilities. Customer should agree and confirm that he/she will not use this Internet Banking facility for money laundering or violate any law related to the money laundering. DBBL reserves the right to demand explanation from the User regarding any matter pertaining to money laundering law of the country. The User acknowledge that the software underlying the Internet Banking as well as other Internet related software which are required for accessing Internet Banking are the legal property of the respective vendors. The permission given by DBBL to access Internet Banking will not convey any proprietary or ownership rights in such software. The User shall not attempt to modify, translate, disassemble, decompile or reverse engineer the software underlying Internet Banking or create any derivative product based on the software. These Terms and/or the operations in the Accounts of the User shall be governed by the Laws of Bangladesh, in force. DBBL may, in its absolute discretion, commence any legal action or proceedings arising out of the Terms for Internet Banking in any other court, tribunal or other appropriate forum, and the User hereby consents to that jurisdiction. Any provision of the Terms for Internet Banking which is prohibited or unenforceable in any jurisdiction shall, as to such jurisdiction, be ineffective to the extent of prohibition or unenforceability but shall not invalidate the remaining provisions of the Terms or affect such provision in any other jurisdiction. DBBL, the User shall be deemed to have accepted the changed Terms. The User may request for termination of the Internet Banking any time by giving a written notice of at least 15 days to DBBL. The termination shall take effect on the completion of the fifteenth day. User must compensate for any loss that occurs as a result of his/her breaking any term of these agreements. 3. It is important to remember to click ‘Log out’ after completing his/her Internet Banking session. If you need help with the log in process of Internet Banking or have technical questions, please call DBBL Internet Banking Help Desk at 880-2-7174095-7. By applying for SMS & Alert Banking for the first time, the User acknowledges and accepts the below listed Terms & Conditions. Notwithstanding anything contained herein, all Terms & Conditions pertaining to the accounts shall continue to apply. 1. DBBL will provide the customer with temporary PIN for SMS Banking in the first instance. 2. As a safety measure, after sending a SMS request to DBBL which contains his PIN, the user should immediately delete the SMS from the ‘Send Items’ or ‘Outbox’ of his/her mobile. 3. As a safety measure, the User, as a customer should immediately change PIN upon receiving the same for DBBL. User is requested to change his/her PIN frequently thereafter as far as possible. 4. The customer acknowledges that the PIN selected act as User’s authorized signature. This signature authorizes and validates directions given just as an actual written signature does. 5. User is responsible for maintaining the confidentially of Customer’s PIN. User should agree that he/she will not under any circumstances disclose his/her PIN to anyone, including anyone claiming to represent the Bank or to someone giving assistance on a technical helpdesk in connection with the service. It should be clearly understood that Bank employees do not need User’s PIN for any reason whatsoever. 6. User should make sure that no one is physically watching his/her PIN when he/she is entering in to the mobile. The PIN should not be written anywhere. 7. If User gives his/her PIN to anyone or fails to safeguard its secrecy, he/she does so at his/her own risk because anyone with User PIN will have access to his/her accounts. 8. If User forgets the SMS Banking PIN, he/she has to request for issue of a new PIN by sending a written request to DBBL. 9. The User agrees and acknowledges that DBBL shall in no way be held responsible or liable if the User incurs any loss as a result of information being disclosed by DBBL regarding his Account(s) or carrying the instruction of the User pursuant to the access of the SMS Banking and the User shall fully indemnify and hold harmless DBBL in respect of the same. 10. DBBL reserves the right to change and recover from the User(s) service charges, as may be fixed time to time. The User hereby authorizes DBBL to recover such charges from his/her account(s). 12. Customer should agree and confirm that he/she will not use this SMS and Alert banking facility for money laundering or violate any law related to the money laundering. 13. DBBL reserves the right to demand explanation from the User regarding any matter pertaining to money laundering law of the country. 14. These Terms and/or the operations in the Accounts of the User shall be governed by the Laws of Bangladesh, in force. As a part of my post graduation program, I have completed my internship in a renowned financial institution named “Dutch-Bangla Bank Limited.” Throughout the period of my internship, I had been working in several departments. I prepared this report concentrating on the Electronic Banking activities of Dutch-Bangla Bank Limited. The report will reveal the background of the company, description of the Electronics Banking activities of DBBL, findings and recommendations based on the experience gathered. There are two main objectives behind this report. The Primary Objective of the study is to fulfil the partial requirement of the MBA program. In the final semester of our MBA program one Internship report is to be submitted. An oral viva will be held on this report. To identify the activities served by Dutch-bangle bank to perform the “Electronic Banking Activities”. To know the types of services which DBBL provides electronically. To learn the operations of ATM machine. To learn the basic requirement of the bank for providing e-banking facilities for the customers. Face-to-face conversation with the respective officials. Practical work experience on different desks of the unit. Different publications, Newspapers and Journals. The activities performed under “Electronic Banking Activities” were identified through informal interviews with the officials and from different publications. The area of my study has mainly been encompassed on the very busy branch of DBBL, ……………….. Branch. The report consists of mainly three broad parts like- The Organizational part, The Electronic Banking part and with that the activities of the bank regarding e-banking. The Organization part includes a description of Dutch-Bangla Bank Limited, its background, history, description of the facilities provided by the Bank. The Electronic Banking part introduced the real mean of E-banking and at last it consists of different activities performed by Dutch-Bangla Bank under the head of E-Banking Activities and summarizing the total contribution to perform those activities. Also, problem identification regarding E-Banking of DBBL and my recommendations has been mentioned in this report. The main Limitation of this report is that it’s not possible to disclose all data and information for the reason of confidentiality. Difficult to have them for equitable long time. As this report is based on information only, it does not include any research. So, any lack of adequacy or authenticity may hamper the contents of the report. Different sources of data has been using in this report, which may create the harmony of the writing & presentation bias. I have completed my internship program in Dutch Bangla Bank Ltd. I was placed……………. Branch. I joined my internship on 1stJanuary, 2011. This is the most oldest and busy branch of DBBL from any other branches of Bangladesh as a result I have gathered lots of experience from there. During my internship period I had not any specific organizational position. So I was got chanced to do worked many desk of the branch. Therefore I had lots of experience in IT area that is why most of the time they utilized me for their computer related works. But I also worked different types of jobs. I worked there five days in a week. My office hour was 10am to 6pm. At the first day of internship Md. ………..(Officer); …………..(Assistant Officer) general banking department introduced me with all of the staff and initially assigned me some tasks. After opening an account the customer generally get his checkbook after seven working days. It takes this time because the checkbook is in the printing form with the account holders name and account number. When the checkbook are delivered by the head office my tasks was to input the check series into the server that is why the customer can use this check number in all the branch of DBBL. It has to be done because DBBL is the fully automated bank. One can issue his check any branch of DBBL and can en-cash his money by providing the check. Generally customers ATM card are send to the customers respective mailing address within 15 working days, but when the currier service failed to receive the card to the customer then it return to the branch and the customers have to collect the cards from the branch along with the pin number. My task was to giving the information to the customers about their card status by using the software. And also give the pin number. My regular task was to meet the customer queries about their account and print the statement if they needed. DBBL charged taka. 115. for giving any statement. But for the first year it is free for the customer. Although every year the bank provides their customers a yearly statement for free of charge by the post. I have also learned the banking software of DBBL named FLEXCUBE from I-flex solution, India. I have to memorize different task code of this software for made my job easier. The entire officer has a unique ID for doing their job. They taught me the software spontaneously, because I had good knowledge in IT before. So I adopted the software very quickly. Receive cheque and check some elements like Cheque include MIRC Number, Cheque back side include Name, Account Number & Contract Number. Crossing of the cheques are done indicating particular branch as collecting bank. OBC carbon copy Bank collected. Collecting bank can collect it either by its branch or by the drawer’s bank. They will forward the bill then to that particular branch. OBC number will give on the forwarding letter. My task was to sending the OBC cheque by the currier and maintains the register until realization. Also I was done the calculation of charges for the OBC. One of my interesting jobs was issuing the Pay Order. Pay order is an instrument, which is used to remit money within a city through banking channel. The instruments are generally safe as most of them are crossed. Income A/C Commission on Remittance*…………………..Cr. By account Client’s A/C ……………………………….…………………………. Dr.
Bills Payable (P.O) A/C ……………..……………………………Cr. Income A/C Commission on Remittance*………………..Cr. By transfer Head office \ other department’s client A\C…………………Dr. Bills Payable (P.O) A/C …………………….……………………Dr. Income A/C Commission on Remittance* …………………Cr. From the above accounting treatments it is clear that the money, which is received by the bank from selling the instrument, is kept under bills payable account (GL Account). It is current liability on the part of bank, which implies that, money received in this purpose has to be paid to the payees collecting bank on placement of the instrument. But in the local banking arena DBBL offers 57.50 tk for issuing of Payment Order for everybody. Problems Identification Regarding Electronic Banking Services of the DBBL. 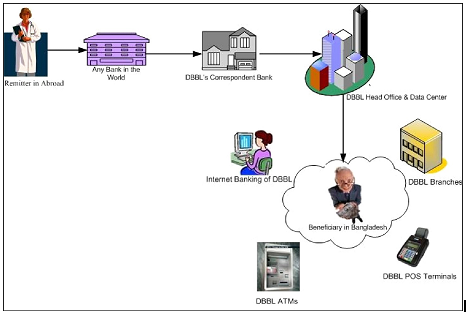 The infrastructure of e-banking in Bangladesh is inefficient so DBBL cannot maintain their e-banking with other banks in Bangladesh. In my experience I found that some day in pick hour the software was very slow and that always creating problem in times of transaction and any other work for the bank. It’s because the FLEXCUBE software is now old and it had a limitation to hold the certain number of account, but DBBL’s policy is to increase more and more account which is because the server was randomly hanged. Though DBBL is trying to give the online service of their customers but there is also some lack of adequate knowledge about the e- banking. I think DBBL has the lack of proper strategic plan that is why they cannot gain and retain a big portion of market share among many other online banks. In Bangladesh there is a lack of international standard communication channel that is hampering DBBL’s e-banking. Improper inter –district telecommunication systems and country wide data communication system, that is why the bank is not able to provide its online services to the country wide. Branch offices cannot be linked efficiently with the head office through single networking based on online real time basis. Lack of attractive remuneration to the technocrats. This motives them to go abroad for higher remuneration. Inadequate budget for establishing the new branches and it online facilities over the nationwide. Lack of integrated plan between the DBBL and the Bangladesh bank authority. Inefficient corporate clearing house facilities of the bank. Though the bank now started their Automated Clearing house but that is not fully implemented. E-banking in Bangladesh that affects on the bank. Only ATM service & pos service of the DBBL are better than the other online banks of Bangladesh, but ACH, home-banking services wire transfer services are not yet swift in comparison of standard chartered bank, the HSBC. The bank cannot provide online services frequently due to the insufficient electricity facilities in Bangladesh. In addition, DBBL credit card has not yet so much popular in the market. Only retail e-banking services are provided rather than corporate e-banking services. DBBL has no specific customer service desk to solve all types of solution like- balance inquiry, statement inquiry, IPO refund inquiry, or any types of complain. That is why customers are creating problems with the officers of the branch. All the officers have to do their own assigned work and they were always busy to do that. Some time server slow so people don’t collect there money. Some of ATM Booth has no money. So customer faces frustration. When IPO share is come in a bank, this time bank rules and customer don’t controlled. Largest banking service provider in the commercial bank and operate near about 1000 corporate client. Gets advantage for ATM card Low deposit rate and minimum balances are too high. Non functioning ATM machines, delay for providing cards. By offering more attractive interest rates, and lowering the minimum balances eligible for interest, the bank can attract a lot of the old customers At present Trust Bank, EBL and BRAC Corp are posing significant threats to DBBL regarding retail and business banking respectively. Furthermore, the new comers in private banking sector are also coming up with very competitive products. All over the world, the dimension of Banking has been changing rapidly due to Deregulation, Technological innovation and Globalization. Banking in Bangladesh has to keep pace with the global change. Now Banks must compete both as local institution and foreign one. The declaration of the Government’s bold and far-sighted decisions to allow banks in the private sectors to play its due role in the economy of Bangladesh, have started the process of creating new and dynamic financial institutions. One such institution is the Dutch-Bangla Bank Ltd. (DBBL). At present; the emergence of Dutch-Bangla Bank Ltd. is an important event in the private banking arena of Bangladesh. Dutch-Bangla Bank Limited is a scheduled commercial bank. The Bank was established under the Bank Companies Act 1991 and incorporated as a public limited company under the Companies Act 1994 inBangladesh with the primary objective to carry on all kinds of banking business in Bangladesh. The Bank is listed with Dhaka Stock Exchange Limited and Chittagong Stock Exchange Limited. DBBL- a Bangladesh European private joint venture scheduled commercial bank commenced formal operation from June 3, 1996. The head office of the Bank is located at Senakalyan Bhaban (4th, 5th and 6th floor), 195, Motijheel C/A, Dhaka, Bangladesh. The Bank commenced its banking business with one branch on 4 July 1996. Dutch Bangla Bank Limited (DBBL) is a public limited company by shares, incorporated in Bangladesh in the year 1995 under companies Act 1994. With 30% equity holding, the Netherlands Development Finance company (FMO) of the Netherlands is the international co-sponsor of the Bank. Out of the rest 70%, 60% equity has been provided by prominent local entrepreneurs and industrialists & the rest 10% shares is the public issue. During the initial operating year (1996-1997) the bank received skill augmentation technical assistance from ABN Amro Bank of the Netherlands. DBBL’s focus is to provide one counter service to clients covering: Commercial Banking (Deposit Accounts), Consumer Banking (Retail Baking) – Traveler Cheques- Foreign & Inland Remittances, Financial Services, Corporate Banking, Asset & liability management, Liquidity & capital Resources Management, Information technology, Human Resources. DBBL, since its inception was active in various social activities, which increased manifold over the period of time and its growth. It is one of the fast growing leading online banks in private sector. The emergence of Dutch-Bangla Bank Ltd. in the private sector is an important event in the banking area of Bangladesh. The Netherlands Development Finance Company (FMO) of the Netherlands is the international sponsor of the Bank. The FMO is the Dutch development bank of the Netherlands specialized in the financing of private enterprises in Asia, Africa, Latin America and Eastern Europe. Dutch-Bangla Bank Ltd. came into existence with joint venture as a public limited company incorporated in Bangladesh on June 26, 1995 with the primary objectives to carry on all kinds of banking business in and outside of Bangladesh. DBBL has started its business with foreign bank. DBBL commenced its business as scheduled bank with effect from July 04, 1995 with one branch-Motijheel Branch, Dhaka, with a motto to grow as a leader in the banking arena of Bangladesh through better counseling and effect service to clients and thus to revitalize the economy of the country. All the branches are currently providing truly On-Line banking facility. DBBL resumed its operational activities initially with an authorized capital of Tk.400 million and paid up capital of Tk.202.14 million. Dutch-Bangla Bank believes in its uncompromising commitment to fulfill its customer needs and satisfaction and to become their first choice in banking. Taking cue from its pool esteemed clientele, Dutch-Bangla Bank intends to pave the way for a new era in banking that uphold and epitomize its vaunted marques “Your Trusted Partner”. Electronic banking is relatively a new concept for Bangladesh. It is not long ago when people wait in queue for long time with token in hand and collects money. But today the scenario is a little different at least in the urban areas. With the blessing of modern banking facility, people can enjoy 24 hours banking facility without going to the bank physically even from client’s residence through Internet Banking or through ATM, POS terminals. At the same we need to be very careful about the fraud. Although online banking fraud in large scale is yet to be reported in Bangladesh we need to take all the necessary measures to prevent it. This can be done through proper education on information technology & sufficient software & hardware support. Proper implementation of online banking will create a positive impact on economy. Dutch-Bangla Bank Limited is the leader in the Electronic banking among the private banks of Bangladesh. It has employed almost all types of modern day banking facilities to provide convenience to its customers. All automated delivery channels are providing round the clock service through the mentioned hardware and software. Due to its contribution to the society as well as national economy, it has made a clear distinction and has occupied a separate and respected position in the banking sector of Bangladesh. Expanding its business arena and volume, it has also accelerated its contribution to the underprivileged of the society. DBBL contributes 5% of its profit for helping the destitute to develop their standard of living and earn a respectable way to keep up with their everyday activity. Considering the issues discussed earlier we may conclude that the Dutch-Bangla Bank Ltd. is not only a profit making organization, it is also a perfect “Corporate Citizen” who always carry out its duties of corporate social responsibilities. As banking sector is service oriented, therefore, banks of Bangladesh must move towards fully online banking. This will enable them to provide round the clock services through all the service channels without deployment of much manpower thus saving time & money and most important of all ensuring transaction security. I think DBBL plays an important role for the economic growth of the country by providing its banking services through over the counter and the on-line services. It seems to me that in DBBL, there is a sufficient opportunity to gain the practical knowledge about the Electronic Banking Activities. DBBL should provide adequate training and technological support to develop the manpower or personnel working in the e-banking section. DBBL should have a strong strategic plan for automated market development. The bank should develop integrated e-banking software within a short period of time. Because I think excess load will be the cause of a big damage for the existing software. A specialized, self-owned organization can be established by the bank so that they can develop the infrastructure of e-banking in Bangladesh that will also be the social responsibility for them. A standard carrier design needs to be formed for the computer experts within the bank so that they do not feel interest to go abroad for lucrative financial offer. Clearinghouse operations are demanded to be fully automated. If it could be implemented, then banks will be motivated to implement in front services counter of electronic bank. To meet the demand of current and prospective clients, banking software to be produced in such that the coordinated effort can supply all information from the front desk. The bank requires systemic and planned budget for expanding e-banking. To provide the nationwide & countrywide services, the bank should expand the number of branches of ATM booth at zonal level so that the most of the people of the country can get the benefit, which live in zonal level, rural level. To take initiative for implementing automated financial sector by coordinate effort of the central bank along with the commercial bank. Credit card services should be implemented rapidly. And the restriction for getting the credit card should reduce. Sometimes I found that the top level officers were so much lazy to do their work, this is a great problem for the officers because without his authorization any transaction will not be completed. If they take much time then the total procedure will be delayed, because the online system is a one channel and step by step procedure. So the lop level managers should have very much conscious about their task. DBBL should increase their branch so that they can pick up most of the market share among the other online bank. I worked in Savar Bazar Branch and I found that the interior design is not so attractive that can attract the customers. They should impose their attention about that. DBBL have to build up their customer services desk and call center for the betterment of their services. Dutch Bangla Bank Ltd, (2010), Annual Report, Dutch Bangla Bank Ltd, Dhaka, Bangladesh. Dutch Bangla Bank Ltd, (2009), Annual Report, Dutch Bangla Bank Ltd, Dhaka, Bangladesh. Md. Niamat Ullah Bokul (Senior Officer) in DBBL Savar Bazar Branch. Dutch Bangla Bank Savar Bazar Branch. Critical Analysis of Credit Approval Process of the Premier Bank Limited.